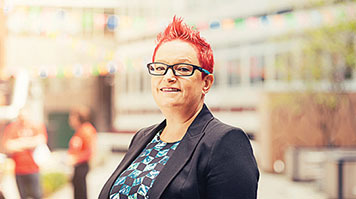 For twenty years, LSBU alumna Dr Sue Black has worked tirelessly to get more women into technology, inspired by her own life-changing experiences. Her steadfast dedication and innovation have earned her an OBE in 2016’s New Year Honours List. She has been made an Honorary Fellow of LSBU. Sue is motivated by the belief that technology has the power to change lives – something that is very much borne out by her own experiences. Having left home at 16, she was soon forced to drop out of school: “I couldn’t pay the rent and study at the same time,” she says. She worked in a café, in accounts for RCA Records, did a stint with the local council, worked with refugees and even tried her hand at nursing. By 25, Sue was living in a refuge, with no job, few qualifications, and three children aged under three. “I knew I needed to build a career and support my family,” she says. “I thought about what I’d enjoyed at school, and kept coming back to the same thing: maths.” Having found a place to live, Sue enrolled in a university access course at Southwark College – then she applied to study computer science at LSBU. Sue ran the group in her spare time while pursuing her academic career, first at LSBU, and later as head of department at the University of Westminster. More recently, she set up #techmums, which offers free training for mums on low incomes and with no computer experience. The six-week programme, based in Tower Hamlets, covers app design, coding, social media and online security. Mums can meet local service providers and entrepreneurs, and find out where to get further training and support. I always say to people at the start of these courses, “If I can do it, so can you”. All I did was work out where I wanted to be and put one foot in front of the other until I got there. Today, Sue is Senior Research Associate in the Department of Computer Science at University College London, an associate at all-female digital consultancy Disruption Ltd and a mentor at Google Campus for Mums. She is also the Daily Mirror’s ‘tech agony aunt’ and writes a monthly technology column for The Guardian. She led a successful campaign to save Bletchley Park, and was recently named among Europe’s top 50 most influential women in technology. Find out more about Honorary Awards at LSBU.